'The world is just not built for people like me,' wails the young Steven Patrick Morrissey (Jack Lowden) as his head swims with depression. Luckily a trio of women are by his side (his mother Elizabeth, friends Angi and Linda) in a film that features a lot of 'be who you are' messaging but few revelations about an incendiary icon who's never been short of an opinion or two. Essentially 'Morrissey: The Early Years', this unauthorised biopic of the Smiths frontman has little to say and is certainly not allowed to say any of it in the singer's own words – not a single Smiths track features, with the film ending as the band begin. Set in Manchester and beginning in 1976, it paints a picture of a maudlin teen and his view from the sidelines of society – how he's shaped by his bemusing interactions with the ordinary (soul-sapping employment at the Inland Revenue, being blackmailed into a date) as he impatiently waits for his genius to be uncovered. Morrissey's renown as a lyricist makes for a cruel contrast to the so-so screenplay, which leans heavily on literary quotations for profundity. 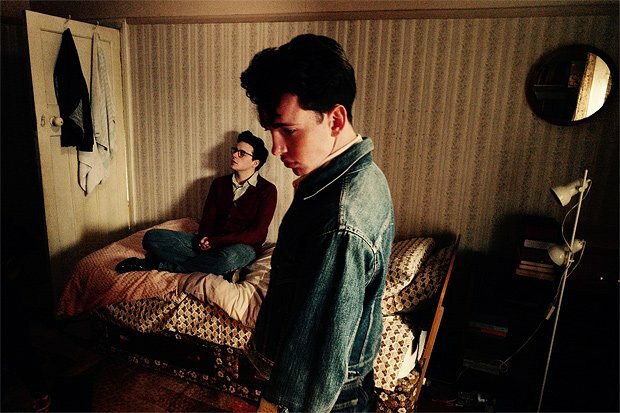 And, while a single, short live performance gives the film a much-needed kick up the backside (bravo Lowden for showing some stage presence here), the lack of attention to what makes its subject special means the whole enterprise feels rather pointless, as the film focuses on Morrissey's frustration rather than his talent. Debut feature director Mark Gill was Oscar nominated for his short film The Voorman Problem and – together with cinematographer Nicholas D Knowland (who did such fine work for Peter Strickland on Berberian Sound Studio and The Duke of Burgundy) – knows how to make the ordinary look extraordinary. There are flashes of the film it could have been in a number of stylishly executed sequences – Steven riding a waltzer after being punched in the face springs to mind – and particularly in the witty and fitting juxtaposition of the pompous soon-to-be star and baffled 'civilians'. The Smiths were, after all, superb satirists. It may just about do the job for those without even a cursory knowledge of the singer's influences, for those who don't know – or couldn't guess from the music – that Morrissey was the product of a troubled upbringing, a huge admirer of Oscar Wilde and obsessed with the Moors murders. The lack of songs and substance, however, means that Smiths fans may well despair. And not in a way they'd enjoy. Screened as part of the Edinburgh International Film Festival 2017. Selected release from Fri 4 Aug.
Manchester, 1976: Steven Patrick Morrissey (Jack Lowden) impatiently waits for his genius to be uncovered. Lowden shows some stage presence but this unauthorised biopic of the Smiths frontman has little to say and features none of the band's iconic music. How can it feature The Smiths music when they hadn't been formed at that point? The film is about Morrissey not The Smiths. The soundtrack reflects perfectly the artists, live and recorded, that influenced both and eventually drew Morrissey and Marr together.